Making a SOLIDWORKS Part Template is a quick and easy way to model in the desired unit of measure, have the appropriate visual qualities and have other specific settings turned on or off. Below is a step by step process of how to create a simple part template tailored to your company’s needs. This process will work for creating SOLIDWORKS part, assembly, route, weldment and drawing templates. Start off by clicking on “File” and then select “New”. A new window will appear, from the default templates SOLIDWORKS provides, we will select “Part” and click “Ok”. With the blank canvas opened we will start to modify it. At the top, select the cog icon for “Options”. At the top of this new window we are going to select “Document Properties”. This is where we will make all the changes. In the left menu click “Drafting Standard” and in the main section select in the drop down box the drafting standard your company prefers. For this example I am going to choose “ISO”. 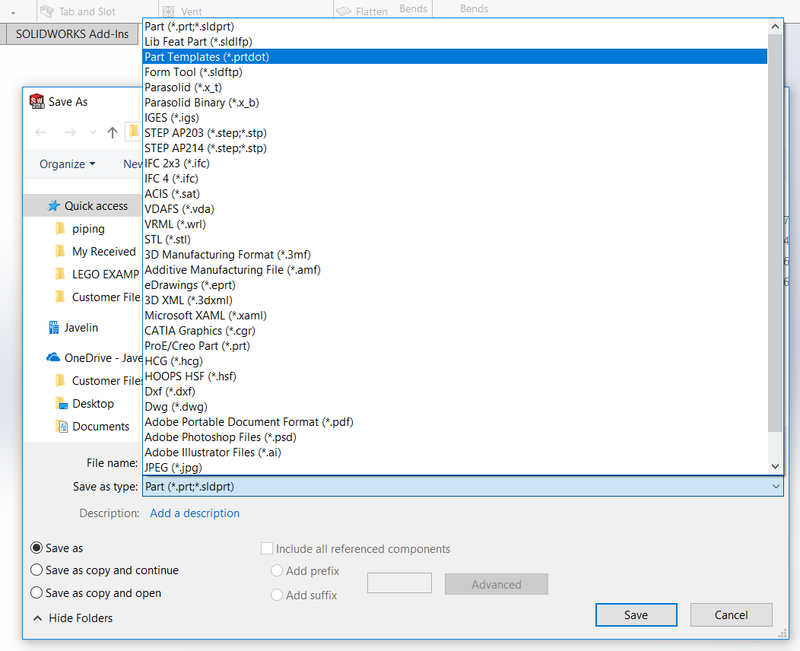 Each drafting standard has its own specific settings that are automatically set. Please notice in the left menu, when selecting “Annotations, Dimensions, Tables” and “DimXpert”, that they are set to the drafting standard you previously selected. These settings can be modified, once modified, the file will have ‘modified’ in the title. We are going to move onto the most popular area, which is “Units”. The units can be adjusted to display what you are modeling in, whether its Imperial or Metric. SOLIDWORKS has quick standards that can be selected. For this example I am going to select “MMGS” (millimeter, gram, second), but then I am going to select “Custom” to customize options. Part way down I am going to customize Mass by selecting “grams” from the drop down box. I am going to select “pounds” for this example. Next we are going to select “Image Quality” in the left menu. 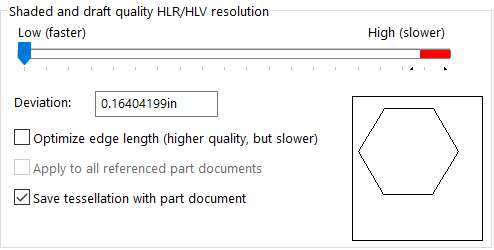 We are going to adjust the top slider bar “Shaded and draft quality HLR/HLV resolution”. Adjust the slider bar to the left and right and you can see the sample circle get shaped into a hexagon or into a high quality circle. For typical parts that don’t need amazing quality (like surfacing retail items), I suggest leaving the bard about 1/3 the way in from the left (Low – faster). This will still have a decent picture and not slow down the performance of that part. To learn more about image quality please refer to our SOLIDWORKS Image Quality article. For this exercise I have made all the changes to the “Document Properties” I wanted, now I will click “OK” at the bottom. Change the “File name:” to what you want it to be called. Mine will be called Metric-Pounds. Finally, click “Save” at the bottom and you’re done. Thank you for following this SOLIDWORKS Part Template how to guide.